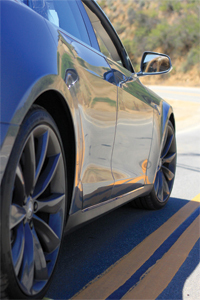 In 2013, Model S won the World Green Car of the Year award, Motor Trend Car of the Year, and Automobile Magazine’s Car of the Year. I’m on a plane about to take off, pressed against the seat of a light aluminum body taking me into flight, only the suspension won’t let me feel the bumps of the runway and I am the one in control—that’s how I felt flooring Tesla S off their design and engineering hangar next to Spacex’s in Hawthorne, California. Tesla’s attempt to create aerodynamic perfection gave it a 0 to 60 miles speed-up time of 4.2 seconds. The football-field sized touch screen monitor—well, just a little smaller at 17”—no doubt inspired by neighboring Apple’s headquarters— controls whatever you can imagine from sunroof and clearance to your Facebook page. Yes, you will have 3G internet even in a canyon. I checked. What do you think you see when you open the hood of this Silicon Valley-made hardware? Right, nothing—a “frunk”—a spacious front trunk. Another big “nothing” is where the transmission bump lies between the seats. Because the electric motor is compact and three times more efficient than the internal combustion engine and the gas tank, catalytic converter and tailpipe are gone, Model S has twice the storage space of other vehicles in its class. Unseen for a sedan volume of interior space brings luxurious feel, continued with sophisticated yet minimalist intuitive design. 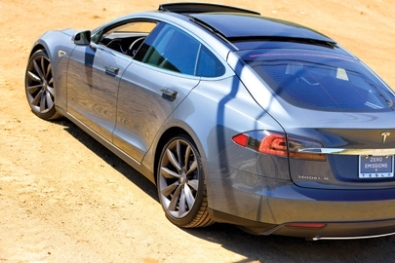 Tesla S claims to be a 7-seat. Two optional seats for kids under 12 fit into the trunk with additional leg space. The car’s hold on winding Malibu’s Corral Canyon was surprisingly stable, considering the light aluminum body, which is explained by the fact that Tesla’s heaviest part happened to be flat—the slim-line lithium-ion battery pack positioned below the floor with a compact electric motor module between the rear wheels, which gives a low center of gravity, adding on feeling of stability. Tesla pushed back retail availability production of its newly planned third generation Model X SUV until 2015. The seven-passenger, falcon-winged SUV outperforms Porsche Carerra 911, says Tesla Motors’ Elon Musk. 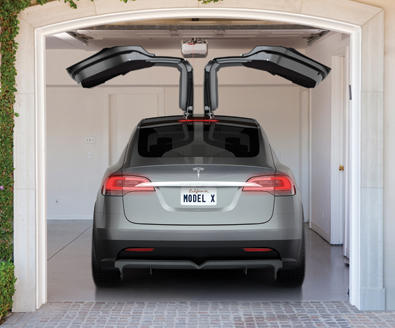 When unveiled in Hawthorne, the uplift doors left ample vertical headroom for walking in and out, and also attracted some linguistic attention because its wings had morphed from 70s’ gulls to a falcon (in deference to Musk’s SpaceX Falcon rocket); interior space surpassed that of comparable minivans. The company says the price range will be the same as for Tesla S.
And the best part, of course—no gas anymore. Ever. No changing batteries or oil. Price? Car needs 30 minutes by a power station provided by Tesla or six hours at an electric socket of 110 or 240V for a full charge of 208 to 268 miles of range, depending on battery option. The cost of electricity to charge is about $15. With price starting at $69,900 one will end up paying about $315.00 for business and $580.00 a month for personal use a month after gas savings. No gas, no maintenance. How much do you spend on yours? Model S, a four-door, four-plus-two passenger, fastback electric sports sedan produced by Tesla Motors, came out strong with the public at the 2009 Frankfurt Motor Show. Retail deliveries began in June 2012. Model S sales are beating everyone in their category. Tesla moved ahead of BMW, Lexus and Mercedes-Benz for 2013, selling half again as many as the Benz sedan. Total sales numbered some 9,650 units through April 2013, which also makes the Model S the top selling plug-in electric car in North America during the first quarter of 2013 with 4,900 cars sold, ahead of the Chevrolet Volt (4,421) and the Nissan Leaf (3,695). The Model S also beats internal combustion competitors in the same price range. 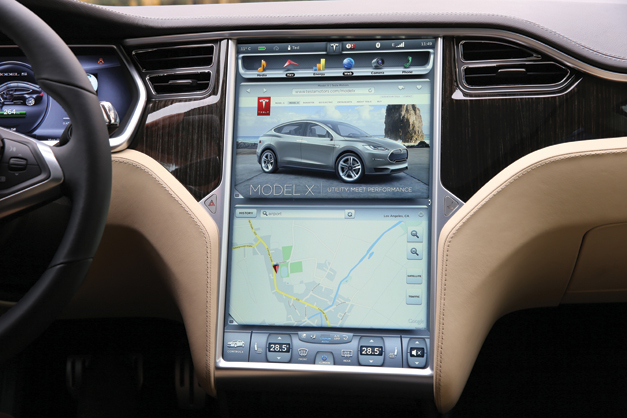 In 2013, Model S won the World Green Car of the Year award, Motor Trend Car of the Year and Automobile Magazine’s Car of the Year. Model S is Consumer Reports’ top-scoring car ever. It achieved a 2012 government five-star safety rating. With 116.5-inch wheelbase and 56.5-inch height, high-strength boron steel elements reinforce Tesla Model S’s lightweight aluminum body. We especially like its UV and infrared blocking windshield and sunroof, rain sensing adjustable speed windshield wipers, flush mounted door handles, and 19-inch aluminum alloy wheels with all-season high-performance tires. The battery has an eight year or 125,000 mile (whichever comes first) warranty.